For over 25 years, TeamBuilding Unlimited has been customizing, developing, and delivering interactive team building programs to an impressive list of clients throughout the United States and beyond. Our facilitators, developers and creative staff offer the ideal combination of experience, customization, energy, and a wide range of affordable and outstanding programs. All TeamBuilding Unlimited programs and events are created in consultation with our clients to reflect their goals and objectives, agenda, specific jargon and buzzwords. 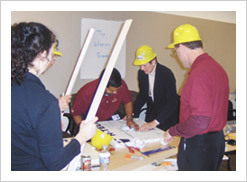 Each team building activity includes an introduction and debriefing by facilitators who will also provide encouragement and assistance with team engagement and instruction throughout the event. And, since we create win-win events, we'll even customize prizes for the multiple winners of our events. 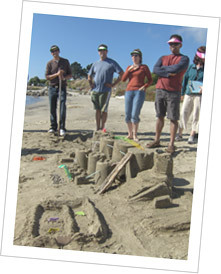 TeamBuilding Unlimited has put together corporate Team Building Programs for thousands of clients representing every facet of the business world from multinational corporations, small businesses, government agencies, non-profits and schools in the San Francisco Bay Area, all over the U.S. and abroad. We have experience working with engineers, sales, marketing, accountants, attorneys, management, retail, construction, manufacturing, and more! 80% of our business is from repeat clients or referrals, so we know we must be doing something right! Frank Price brings a variety of theoretical and practical experiences to the world of team building and interactive activities. He has been a leader, a teacher, a consultant, a mentor to teachers and an athletic coach at every level from Kindergarten to University. His three-year Peace Corps experience in Francophone West Africa and his later Fulbright-Hayes scholarship to Nigeria were two significant factors in his professional development and world outlook. Frank Price has created many customized team building and team bonding activities for numerous corporations nationally and internationally. His goal is to provide innovative and thought provoking activities to every event he produces. High energy, focus and attention to detail are all part of what Frank brings to team building. Janet Rudolph has over 25 years in team building, hospitality, and meeting planning. She holds an M.A. and Ph.D and has applied her knowledge and education to developing programs that meet the needs of each client. TeamBuilding Unlimited was originally created as an extension of Janet Rudolph's Murder on the Menu, but quickly grew into its own successful company. Rudolph has planned meetings and events for national and international corporations and non-profits. She is a member of Meeting Professionals International, International Society of Special Events, the San Francisco Convention and Visitors Bureau, the San Mateo CVB, the Napa Chamber of Commerce, Sisters in Crime, Mystery Writer of America and serves on the Board of Left Coast Crime. All facilitators and staff at TeamBuilding Unlimited bring their energy and creative talents to ensure your group has the best program. We know that every organization is different, and we address the specific needs of each of our clients. We find out about your goals and objectives and agenda, so we can develop the best team building program for your group. We strive to achieve and surpass your goals. We have lots of programs that can be customized for your group, and we always love to brainstorm new ideas and activities. Whether you are planning to hold your event in a hotel ballroom, at a park, in a city center, out in the country, or on the beach, we will come to you with all the equipment and supplies necessary. If you aren't quite sure where to have your program, we can help you every step of the way with suggestions on location or anything else that needs to happen to make your event a success. Our careful attention to detail is one of the many reasons we have such a loyal client base.